Originally from Switzerland, the Appenzell Mountain Dog is a medium-sized breed that was historically used as a flock guardian, draft dog and general farm dog. While this breed still fulfills these purposes today, these dogs also excel in obedience competitions. Appenzellers are loyal and protective to those they love. This breed is intelligent, lively, loving and will welcome people they know but are reserved and aloof towards strangers. As a brave and tough dog, they are willing to fight to the death if they feel their family or territory is threatened. They enjoy staying close to their family and do not roam or like being chained up. These dogs are active, friendly and gentle and are happiest when they are close to their loved ones. The straight-haired double coat of the Appenzeller is easy to care for and requires little attention. As a firm, close-fitting coat, it should be brushed from time to time to remove dead hairs. 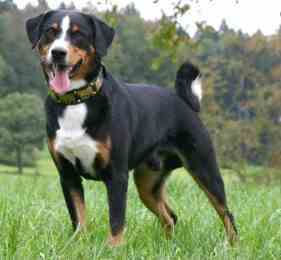 The Appenzell Mountain dog can be prone to eye problems including ectropion and entropion. These dogs are also sensitive to hip dysplasia. This dog breed does best in rural or suburban settings and does not enjoy being chained up. Appenzellers require regular exercise and plenty of wide open spaces, so they may enjoy a free run. Appenzellers should be socialized early in life for the best future temperament. They respond well to positive training and this type of training is generally the best for these dogs.